We want to protect you and your family from food poisoning in your own home, particularly when handling chicken. So we’re saying: ‘Don’t wash raw chicken’ say the Food Standards Agency. This is because of a food bug called campylobacter, the most common cause of food poisoning in the UK. Splashing water from washing chicken can spread campylobacter. Thorough cooking kills it. Campylobacter can be spread easily and just a few bacteria could cause illness. This could come from raw or undercooked chicken, or from contamination due to washing raw chicken. The easiest way to protect yourself and your family is to follow our simple food safety tips every time you prepare food. 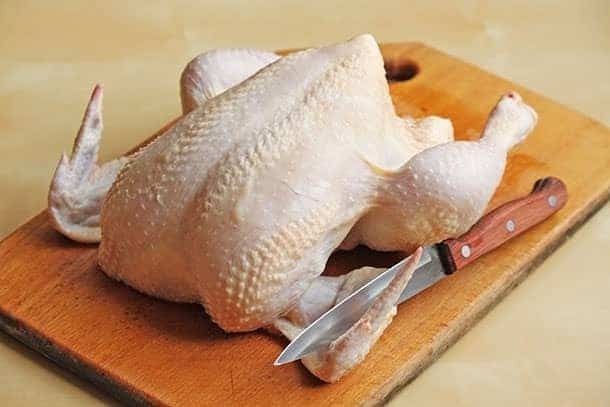 Cover raw chicken and store at the bottom of the fridge so juices cannot drip on to other foods and contaminate them with food poisoning bacteria such as campylobacter. Thoroughly wash and clean all utensils, chopping boards and surfaces used to prepare raw chicken. Wash hands thoroughly with soap and warm water, after handling raw chicken. This helps stop the spread of campylobacter by avoiding cross contamination. Make sure chicken is steaming hot all the way through before serving. Cut in to the thickest part of the meat and check that it is steaming hot with no pink meat and that the juices run clear. Campylobacter infections typically cause abdominal pain and diarrhoea for between two and five days. Cross contamination occurs when harmful bacteria such as campylobacter are spread between food, packaging, hands, surfaces and equipment. Avoid cross contamination by keeping raw and cooked foods separate and washing utensils after you have used them for raw meat or unwashed vegetables. This prevents bacteria spreading to other foods that are ready-to-eat. Campylobacter causes more cases of food poisoning than E.coli, listeria and salmonella put together.